What Makes A Diesel Locomotive Work? What Makes A Steam Locomotive Work? #49 on display, August 21, 2004. Paul Swanson photo. The #49 was one of four 2-8-0’s constructed in March 1929, by the American Locomotive Company’s Schenectady Works, for fast freight service on the Kewaunee Green Bay & Western across central Wisconsin from Kewaunee to Winona. These time-freights transported auto frames and other parts for the Ford Motor Company from their Detroit area plants to a Ford auto assembly plant in St. Paul, Minnesota. KGB&W’s line provided the middle link in the most direct route between Detroit and St. Paul, bypassing the congested Chicago area by crossing Lake Michigan on a carferry. 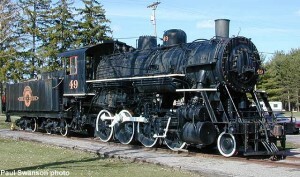 #49 on display, April 2000. Paul Swanson photo. KGB&W took possession of #49 on April 15, 1929 and the locomotive was placed in service the next day. Special modifications were made to #49 so it could make the entire 214-mile trip across Wisconsin without changing. #49’s heyday was shortlived. 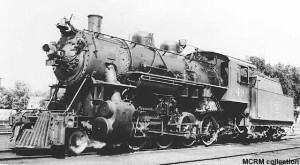 After the Green Bay Route’s line was rebuilt in 1936, six heavier 2-8-2’s were purchased to replace the smaller 2-8-0’s on the fast freights. At this time #49 was renumbered to #350 and downgraded to wayfreight and carferry loading duties. 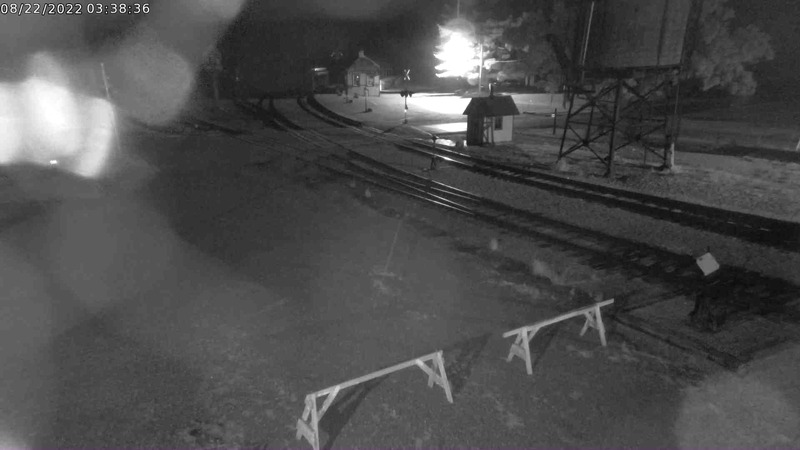 By the 1940s, #350 was holding the local freight between Winona and Wisconsin Rapids. She traveled 1,764,000 miles in 21 years on the system. After an overhaul in Green Bay, on November 14, 1950, #350 was sold for $9,000 to Consolidated Water Power and Paper Company, a leading manufacturer of high quality coated paper. 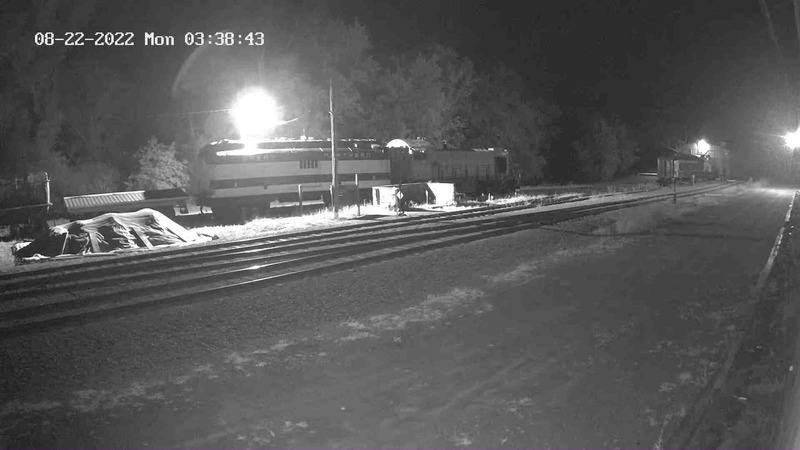 Consolidated in turn used #350 for switching at their Wisconsin Rapids plant. The tender sides were cut down to improve visibility during switching duties. Consolidated last used #350 in January 1957. Two months later, #350 was donated to the city of Wisconsin Rapids for display in the municipal zoo. Pennies donated by school children paid for its painting and display costs. By 1981, the locomotive was no longer wanted; Wisconsin Rapids donated #350 to Mid-Continent. at Wisconsin Rapids, WI; August, 1954. Ted Schnepf collection, from Paul Swanson. In the fall of 1981, after preparation by Mid-Continent volunteers, #350 was moved to North Freedom. 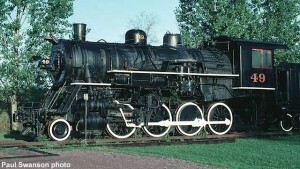 In 1982, she received a cosmetic restoration to return her pre-1936 appearance and number. #49 was placed on display at the north end of the Coach Shed. In 2004 #49 was moved to the display yard alongside the Freight House. #49 at Green Bay, Wisconsin, 1934. MNCRM collection. 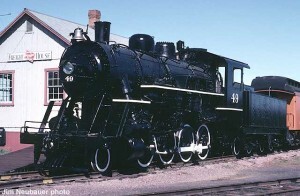 In the late 1980s #49 was evaluated for possible restoration to operation. The rear flue sheet and flues require replacement and running gear must be rebuilt. In August 2004, #49 received a new coat of paint. 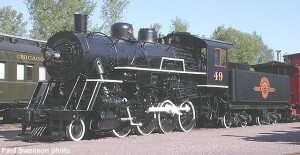 #49 is the only surviving steam locomotive of the Green Bay Route, merged into Wisconsin Central in 1993. #49 builder’s photo, 1929. MCRM collection. Special thanks to John Gruber for historical information.